Google, not to be outdone by Square's recent announcement of its Card Case app that attempts to turn smartphones into credit cards, is rumored to be ready to show off a new mobile payment platform that works with near field communication technology, or NFC. According to The Wall Street Journal, Google is expected to give details on its new platform -- which will allow people to make purchases, redeem coupons, and get points just by waving their NFC-embedded smartphones in front of a special reader -- at an event in New York on Thursday. The Journal cites "people familiar with the matter" as saying the program will launch first in New York, then San Francisco, before rolling out to other parts of the country. The current lineup of participating retailers includes Macy's, American Eagle Outfitters, and Subway restaurants. The platform will use NFC technology -- a term that's been bandied about lately in the mobile phone world, but that hasn't really been seen yet. 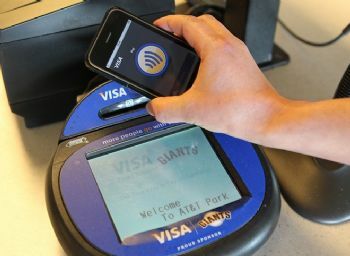 NFC chips will be embedded in Android smartphones, and will talk to special readers at the point-of-sale. In other words, this technology should literally turn your phone into a credit card -- unlike Square's new app, Card Case, which requires customers to "open tabs" (similar to "checking in") at participating establishments, before paying via the app. Google's platform will be more than just a credit card, though. The new technology will also allow users to manage their credit cards, get discounts, and "check in" for loyalty points at participating retailers. The Journal's unnamed sources say that Google will partner with Sprint to bring NFC-embedded smartphones to customers this year. So it looks like Sprint will lead the race -- AT&T, Verizon Wireless, and T-Mobile will reportedly not have NFC-embedded smartphones until the middle of next year. The real question, of course, is security: If a special little reader can take and use your credit card data from your phone, how is Google going to ensure this only happens when you want it to happen?